Sorry I have been so silent. I Amon retreat, and Internet access has been spotty. But then, that isn't my focus this week! Sad about Pope Benedict. Pray for the conclave now. You may be wondering what that first reading is about. that something about our world makes it hard for us to appreciate this scene. If you and I go out, tonight after dark, and look at the stars, how many will we see? The truth is, we will not see most of them, because of all the light. The light of our cities makes it impossible to see what Abram saw. I have a confession to make. I'm 50 years old, and I've never seen the Milky Way! Because I've always lived in the city. which is what you have to do to see the stars Abram saw. it's also all the ways we entertain ourselves. is an hour I can avoid thinking about the deeper things of life. Which is what happens when you look up into that sky. his name hadn’t yet been changed to Abraham. He asks, How will I know I am to possess this land? What follows is a covenant ritual. Notice: Abram was not the one who walked the walk. The flaming torch was the sign of God doing so. To accept death if he failed. And yet he still accepted death: death on a Cross! God performed a covenant ritual and Abram witnessed it. In the same way, the Cross and the Eucharist are God’s promise to us. So how does the Gospel we just heard fit in? to endure what happened on Good Friday. They would see the Lord humiliated and cruelly murdered. Would they keep their faith? And of course, this works for us, too. We see or hear things that shake our faith. Maybe we wonder, like Abram, if God’s promises will be kept. Or when there’s a scandal with a bishop, or priests, or religious. And then the media crow about it and we feel humiliated. that the glory of the Lord is often hidden--but it’s there. the glory of the heavens from our view isn't God's doing. We did that. But the glory, though hidden, is still there. That’s what the Cross is. That’s what the Mass and the Eucharist are. That’s what we put our faith in. A couple of weeks ago, my friend Father John Zuhlsdorf posted a suggestion on his blog: perhaps this Lent, as he steps down from the Chair of Peter, we might use the Stations he composed for use in 2005, by his predecessor, Blessed John Paul. As I prepared to lead stations tonight at Saint Rose, I decided to do it. Unfortunately, I had no booklets; but I was able to copy the material from a website online, and then set it up in makeshift pamphlets for the people to use. If I had more time, I could have prepared nicer booklets, alas. In order to keep the pages manageable while keeping the text readable, the pamphlets I passed out tonight only had the parts the people would recite--the meditations the Holy Father prepared, I only included in my copy. Now, fair warning--they are a bit long. We would normally be finished around 8:40 (we also had Benediction afterward, to conclude a day of Exposition); tonight it was just shy of 9 pm. In fact, I shortened them a bit as it is; the Holy Father also included a reading of Scripture for each station. And, I omitted the Our Father, Hail Mary and Glory Be that are usually included. That said, the Holy Father's meditations are--as you might expect--beautiful. If you want to use them in your parish, and you want me to email the materials I prepared, mention in the comments. and be tempted by the devil. Let’s talk about a fact of life: each one of us is tempted. although that is part of it. is about more weighty matters. Second, about power: if only I were in charge of everything! And above all, about trusting God--or not. he will step down later this month. the way we think the Church ought to be! All they are thinking about is power--totally missing the point! is this some sort of sign of the end of the world? how about a weekend of silence? Or just a day? The reason we do these things is to confront these deeper temptations. Is Jesus the Lord; or am I my own god? isn’t it, at bottom, a refusal to trust God? If I trust God, why worry? If I really trust God, why be afraid? If I let God be in charge, then I can let him be angry. How far into the desert do I want to go this Lent? ...Because XU does things like this. And this. And this. And hires people like this who teach this. I can't control what Xavier University does. But if someone asks me if I recommend attending XU, what I am supposed to do? Lie? When I began Mass today, I wasn't going to offer a homily. It's not required for daily Mass (but is encouraged); it's good for folks to have some silence to reflect on the Scriptures and on the prayers of Mass; and many people at daily Mass have to get back to work--so I try to keep things moving, yet reverent. But as I listened to the readings, a point came to mind that I decided to share. It occurred to me that what our Lord told people to do, in the Gospel, is directly the opposite to what the so-called "progressive" Catholics (bonus: check out the Apostle John's advice for such folk in 2 John 1:9) say the Church should do. Our Lord said, if you want to be my disciple, take up your cross; deny yourself. Yet what do so-called "progressive" Catholics (typified by the National Catholic Reporter*), in league with secularists, given voice by the likes of the New York Times, say? They say, oh no, what the Catholic Church asks of people is too hard! What you have to do is drop all that talk about marriage, chastity and self-denial; that'll get lots more people! So who do you believe? The National (so-called) Catholic Reporter--or the Son of God? This isn't just a homiletic point--it's personal. Only after I was driving to the office downtown did I realize that this very issue was what helped bring me back to the Catholic Faith. I spent a decade as a Pentecostal and then an Evangelical in my 20s; I had a conversion experience while in college, and I took that to mean I should leave my Catholic Faith. It took me awhile to work that out. And one of the things that happened was that, on my own, without reading anything Catholic--other than the Bible of course--I came to the conclusion that God did not endorse the "people are the problem" mindset; that contraception completely contradicts what the Bible tells us about love and life. And I remember when I made this point, in a conversation with some of my fellow, "on fire" Evangelicals, a young woman in our group turned on me, with a ferocity that shocked me, and said, "are you going to feed those children?" Given her surprising reaction, I chose not to pursue it; but I thought about her response. Aside from the non-sequitur of the response, I pondered what, in substance, she was saying. I wish I had asked, but: was she saying that God didn't want too many people in the world? Sorry, I don't believe it. Did God fail to provide for plenty of people? Again, wrong answer. Was she saying that it's just too hard for couples to have a marriage without recourse to contraception? Even if that wasn't her point--it surely is what "progressive" Catholics and others who advocate allowing contraception say. It's too hard. And I remember thinking of the very thing our Lord said in the Gospel today. Take up your cross. Since when have we argued that a teaching of the Faith is false...because it's too hard? Tom Roberts, editor of the NCR: "Um, Rabbi, that won't sell. That's not where people are today." Lord Jesus: "What? Won't sell?" Roberts: "That taking up your cross business. Don't you think you should adapt your message to the way people live today?" Jesus: "I didn't come to adapt the Word of God to the world; I came to call the world to the Word of God." Roberts: "Well, the Jesus I know and serve loved people and didn't impose a lot of rules on people!" Jesus: "OK, well, there are many who claim to speak for God. The Father sent me. I have come to testify to the Truth." Jesus: "I am the Way, the Truth and the Life. No one comes to the Father but through Me." Roberts: "Huh. That's pretty pre-Vatican II stuff there, Rabbi. People won't like it." Jesus: "What are you talking about? 'Won't like it'? Dude, they're gonna crucify me. Have you been listening to anything I'm saying?" Roberts: "Hey, this has been nice, but King Herod's having a "sensual spirituality" seminar this afternoon, so I've gotta book out of here. But seriously, you're gonna need to rethink all this. I'll be happy to help you, let me know." Jesus: "Hm? Sorry, I was just praying. For you." * My friend Father John Zuhlsdorf aptly dubbed the NCR the "National Schismatic Reporter"; I have come up with several alternatives of my own--all to emphasize the point that calling that outfit "Catholic" sticks like a fishbone in the throat of anyone who knows the folks there, and knows what being Catholic means. What name will the new pope pick? I have no idea what thoughts go through a man's head as he's contemplating being chosen pope. How do they pick a name, for example? 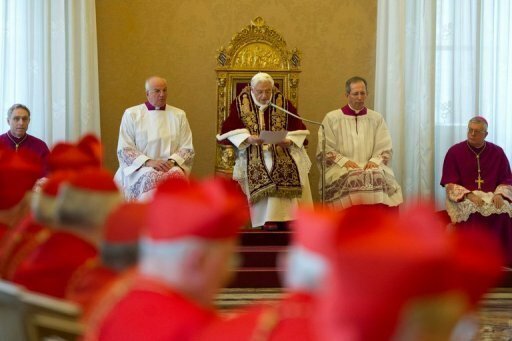 I suspect many, if not most, of the cardinals who will vote in the conclave have considered the possibility they may be elected; and if so, they've thought about a name. In any case, I note that popes have, for a very long time, taken a name someone else had before them. The last pope who wasn't the 2nd or sixteenth (not counting John Paul I) was Pope Lando in AD 913! A pope can use any name; he needn't take a new name at all. But considering it has been 1,100 years of the same thing, breaking such a precedent would be rather startling, and I don't know why a new pope would want to start that way. So I'm guessing the next pope will not be ____ the 1st. So what might it be? And what would the choice signify? Benedict XVI? It seems to happen a lot--two popes in a row with the same name. John Paul III? I doubt it, because it might seem as a commentary on Benedict XVI. Paul VII: Let's revisit Vatican II. And let's talk about Humanae Vitae! John XXIV: because it might be fun to see just how many Popes John we can rack up. Pius XIII: this would scare some people. Leo XIV: this would really be a curve-ball. Clement XV: the previous Clement suppressed the Jesuits and knighted 14-year-old Wolfgang Mozart. Going further back, we come up with: Innocent XIV; Alexander IX; Urban IX; Sixtus VI; Marcellus III; Julius IV; Callixtus IV; Nicholas VI; Eugene V; Martin VI; and Boniface X. So what would you like to suggest, and why? How might we react to Pope Benedict's abdication? Like many others, when I woke up yesterday to the clock radio by my bedside, one of my first conscious thoughts was, "wait--what did I just hear?" I assumed, because I was sleepy, I misheard the reporter; but I hadn't. One of the things we might do is fortify ourselves for a big bargeful of nonsense being spoken about the Church. I listen to NPR, which sometimes is worthwhile, but other times is a penance. I was so sorry to hear them trot out Silvia Poggioli, their vaunted "Roman correspondent." I don't know what this woman's accomplishments are, but knowing anything about the Church is not one of them. This morning, she was saying things like, maybe now the Church will reorganize it's governance and be "more collegial," while the reporter interviewing her, asked breathlessly, could we get someone, you know, more liberal--meaning, more amenable to things like contraception and redefining marriage and the whole modern secularist wishlist. Then there is the nonsense about what Pope Benedict's legacy will be. Ms. Poggioli and the other reporters...heavens they are shallow. True, his decision to step down will be part of his legacy. I wish he hadn't, but he didn't ask me! And I trust his judgment. But really, the obvious legacy will be in setting in motion a "hermeneutic of continuity" as applied to the Second Vatican Council and the Deposit of Faith in light of recent times. People have short memories. It wasn't so long ago that many folks seemed to think everything was up for grabs. That was how people reacted in light of the Second Vatican Council; and when Pope Paul VI stood by constant teaching on openness to life in Humanae Vitae, it was shocking to many who had imbibed the idea that Vatican II was all about a new Church, rather than a renewed Church. It fell to Blessed John Paul to steady the bark of Peter and smother a lot of nonsense. He was accused of putting on the brakes--and that's true. He hit the brakes when many members of the Church were intoxicated with a "spirit of Vatican II" and the Church was careening dangerously. John Paul helped us sober up. But it was Benedict who, once we sobered up, began presenting some good sense about how to understand the Council and how to go forward. And the great stroke of his, which will cement his legacy, was his decision to free the celebration of the older form of the Mass and the sacraments. Most people miss how significant this will be, because the change it will bring isn't being felt right away. But let me illustrate how much this has changed things. I entered the seminary in 1997 and was ordained ten years ago in 2003. During that time, any seminarian who expressed anything more than mild curiosity about the older form of the Mass, and the liturgical and sacramental tradition that prevailed before the Council, came under immediate suspicion. The idea of actually wanting to learn the older forms, let alone celebrate them, was radioactive. Now priests are free to learn the older forms and use them--and they are. Seminaries are beginning to teach the older form of the Mass; and even if they don't, there are growing opportunities to learn these things outside the seminary. Unless a future pope suppresses this--which is possible, but I doubt it--this will grow and grow. It's no secret why Pope Benedict did this. He gave us two reasons. First, he wanted to make clear that what was good and holy before the Council remained good and holy: a commonsense truth that even so became obscured for awhile. Second, he talked about having the older form and the newer form of the liturgy and sacraments to influence each other. Before he was elected pope, Benedict wrote a book called The Spirit of the Liturgy; and in it, he made clear that he was supportive of reform in the liturgy, but he believed the first draft of it, as it were, didn't quite get it right. A lot of folks would like him to have imposed a second draft; but I think he was wise in not trying that. Instead, he considered how he could plant the seeds that would, on their own, grow up and produce a good harvest. I think he has planted those seeds, and during the next 20 years, we'll see the effect. Back to the nonsense we have to endure: some of it will come from well meaning folks who decide this is a sign of the Apocalypse. Well, what if it is? Don't you want the Lord to return and put things right? But chances are, it's not. In any case, it's out of our hands. So back to my fundamental question. How might we react? Whenever I see Pope Benedict, he always seems so peaceful. No doubt it's partly his disposition; but it's also the fruit of a lifetime of good habits, including the habit of prayer and faith. So, if you love the pope, imitate his example. Second, when I consider the popes we've had in recent times, I think we should be very grateful. Going back over a century, we've had a good run of popes. By all accounts, they were wise, capable, courageous men of prayer and good judgment. Our enemies delight to tell tales of scoundrel popes; they happened, but they were rarer than we are led to believe. Even so, none of our recent popes looks anything like that. And each pope we've had, I think, has brought us something we needed. They aren't perfect and the fact that they are protected from teaching error in formal ways (that's what infallibility means), doesn't mean they are all-knowing or all-wise. That they make mistakes isn't remarkable; what's remarkable is that things work out as well as they do. I think Paul VI himself realized that he ought to have handled the implementation and aftermath of the Council differently. Yet his greatest hour will be standing firm on Humanae Vitae, and I feel certain the next few decades will see his teaching completely vindicated. I think John Paul II played a decisive role in so many ways, even if he didn't play the role many might have wished. He was, I think, given a more difficult task than any pope since Pius XII, and few would have carried it off. He did. And then there is Pius XII, one of the most heroic popes in the entire history of the Church, who still bears the slanders heaped upon him as a consequence of the Cold War: I pray that his good name will be restored in my lifetime. Pope Benedict has likewise played an important role--we may find, in time, a pivotal role. One of the things I admire about him is his humility. Many people remarked, when he was elected, that he would suffer from the towering reputation of John Paul II. Benedict didn't seem to mind very much. When he issued his first volume of Jesus of Nazareth--that he would write such a scholarly yet accessible work as pope is itself remarkable--he said something astonishing in the forward. He said, in effect, even though I'm the pope, I offer this only as a scholar might. Anyone is free to find fault with my writing here! Some of the shallow talking heads we're enduring this week have pointed out that Pope Benedict actually drew more people to his audiences than Pope John Paul did--but they don't tarry to consider why. So: blessings to Pope Benedict! Pray for him and for the conclave. Trust in the Lord and be about his work. or things suddenly fall into place and they realize the truth about God or about themselves. These are moments of conversion. The opportunity is here. This Wednesday begins Lent. If we choose, Lent can be a time when we have an encounter with God. They’re good things; but perhaps we love them too much? When our Lord said to Peter, leave everything behind, What if Peter had said no? I was afraid to go out too deep. And then one day, I launched out across the entire pool. What a thrill! What freedom! Giving up things; and giving things away, gives us the freedom to say yes. it’s so that we can give to the poor the money we would have spent on ourselves. on top of fasting and giving to the poor--is prayer. when we’ll have Stations of the Cross and Benediction. In the back of church are sign up sheets. If we are going to ask our Lord to be on the throne of the altar in our church, shouldn’t we show up? but also for practical reasons: the church doors will be open. If you want to see the Lord, he will be on this altar every Wednesday! on Friday and Saturday mornings at 11 am till Noon. and again at 4:30 to 5 pm; and on Saturdays, noon to 3 pm. Saint Xavier Church, downtown, has confessions Monday to Saturday from 11 to Noon. and after the 12:10 pm Mass each day. The sacrament of confession is the sacrament of conversion. We heard both Isaiah and Simon Peter say, Lord, I’m a sinful man. but the Lord had a different idea: leave your sins behind and follow me. The grace of confession helps us to do precisely that. Do you want to meet the Lord this Lent? You can. He’s ready. Are you? It isn’t just the second reading that’s about love. They are all about love. God’s People were on the wrong road; they had to be warned. In baptism we received the same call as Jeremiah. We share our Church’s mission to speak the truth in love. Do not be surprised if it happens to the Church--which it is. is being received with anger. Even from within the Church. who tried to throw him off a cliff. Don’t be discouraged! The truth will be vindicated in time. that we had a crisis of too many people. contraception and abortion and sterilization. And, of course, they are still saying that. as part of our health care plans. But a funny thing has happened in the years since. All their predictions proved false. All of them. But we have millions more. That it would increase women’s dignity. and men -- more than it does. but a secular foreign-news publication, describing Japan. Remember when they said Japan would overtake us? because they have too few children. And it maybe too late. about Russia, Europe, Mexico, even China!--and now, us. and therefore it is a man and a woman--is also drawing fury. but that’s not what love does. God calls us to give the warning. and to call others to faith. So: do we know our Faith? Can we explain it to others? I'll have the first of a monthly series of talks on the Creed. We'll look at who God is and what Faith is. Seven to 8:15 pm, downstairs; men, women and children all welcome. Thanks to the Knights of Columbus for sponsoring this! And first and last, we do it out of love. but what truly is good.